Mr. R has been in the great (and warmer) state of Texas for a week now at SXSW. For the second year in a row, I keep thinking how unfair his proximity to the Jeni’s ice cream truck is. This thought subsequently reminds me of how unfair it is that Jeni’s opened a location less than 15 minutes walk from Mr. R’s old apartment in Chicago a few short months after we moved away. Then I start thinking about how few DQs there are near Boston and how they all close for the winter (ice cream is not seasonal…just a friendly fyi). 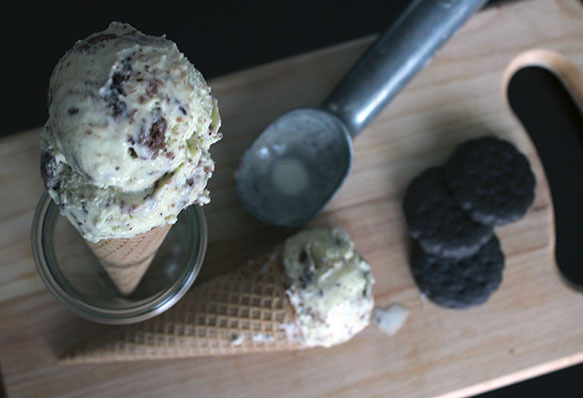 If you give a mouse a cookie….she’ll think about ice cream all day long. I’ve been taking advantage of his absence this past week to make a mess of the apartment try to catch up on a long list of priorities while my laundry basket is emptier than usual. Between work, keeping up a routine at the gym, and three active quilting projects; thinking of something to share here has been bumped to the bottom of my priority list for a while now. But with Mr. R due to arrive at BOS Logan airport at 10:30 pm this evening, I have no more time to procrastinate before a stuffed suitcase gets unloaded into the hamper. * Who said baby food had to be of the pureed, single flavor variety? Those boys are already gnawing on scones and I couldn’t be prouder! **I’ve also been known to skip dinner completely and just eat ice cream, but Mr. R frowns on this practice. He only condoned it once when he felt guilty for instigating the ski trip that left me with a broken shoulder and slightly high on nauseating pain killers. So I decided not to pretend that I eat like a queen while the Mr is gone. I never implied any intent to share a balanced diet via this blog, only my fervid enthusiasm for all things baked and sweet. Savory posts are purely a bonus. What better way to embrace Mr. R’s absence than with ice cream? 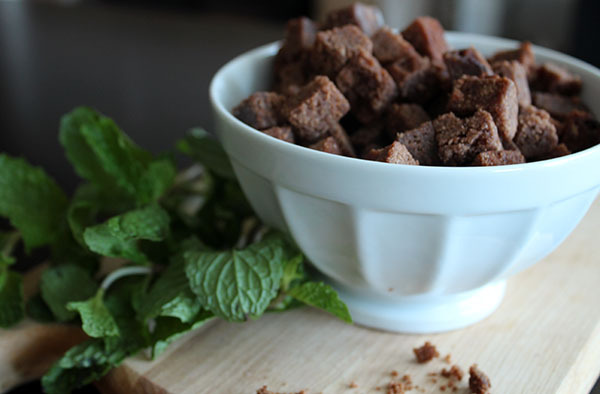 With a Baggie of leftover frozen brownie scraps in my freezer and a fresh bunch of mint from Wilson Farms on the counter, an enticing flavor combination was swirling in my head. Lesson 1: Never remove the ice cream bowl from the freezer. Lesson 2: Stop whining; see lesson 1 above. 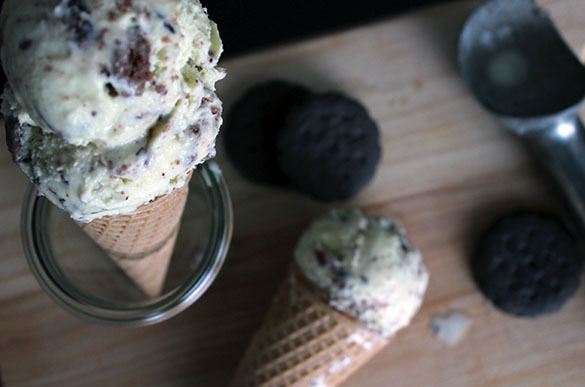 Mint and chocolate are a natural pairing. 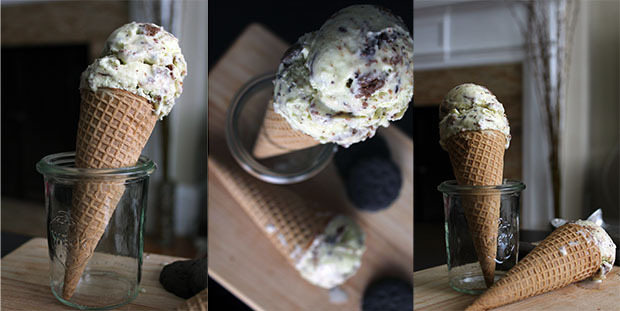 This ice cream uses fresh mint leaves, which creates an ice cream that’s so much more refreshing and interesting than using extracts. 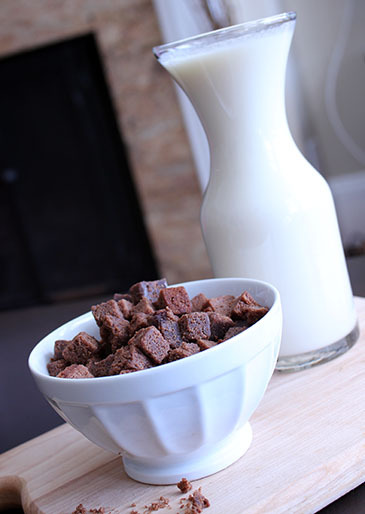 The nice thing about fudgy brownies is that they stay chewy even after the ice cream is frozen. If you don’t happen to have fresh or frozen brownies on hand, store bought will do. Also, seeing as certain girls have been on a cookie selling spree lately, I highly recommend crushing up a sleeve of the thin mints I know you have stashed in the freezer instead. In a medium pot, combine the milk, corn syrup, sugar, and a dash of salt. Heat over medium, stirring occasionally to dissolve the sugar just until bubbles start to form around the edge of the pot. Turn off the heat, submerge the mint leaves in the hot milk, cover the pot, and let steep for 1 hour. Pour the milk through a sieve to remove the mint leaves and press down on them with a spatula to remove the residual liquid. Return the milk to your pot. Whisk the egg yolks together in a medium bowl. Pour the cream into another bowl (~4 cup capacity) and set aside. Heat the milk over medium again until bubbles form around the edges of the pot, but do not let it come to a boil. Using a ladle, transfer some of the hot milk mixture to the egg yolks while whisking continuously. Repeat with 2-3 more ladles of milk to temper the eggs. Now, transfer the egg mixture back into the pot while stirring with a spatula. Continue heating the mixture and stirring constantly until the custard visibly thickens. Do not let it boil. Once the custard has thickened, turn off the heat and pour it into the reserved cream through a sieve to remove any curdled egg. Stir to combine and add a drop of green food coloring if desired. Let the cream come to room temperature, stirring once in a while to prevent a skin from forming. Cover the custard with plastic wrap directly against the surface and chill completely in the fridge. Once chilled, freeze according to your ice cream machine instructions. While the ice cream is churning, melt the chocolate chips using 30 second intervals on your microwave and stirring in between. In the last few minutes of churning, pour the melted chocolate into the ice cream. Scoop the finished ice cream into a pre-chilled container. Fold in the brownie chunks. Freeze until firm.